July 5th, 2017, Vancouver, British Columbia: Evolving Gold Corp. (CSE: EVG) (FSE: EV7) (OTCB: EVOGF) (the “Company”) is pleased to report that it has received complete analytical results of its Toro Project till sampling program (for details, see news release dated October 13th 2016) from C.F. Mineral Research Ltd., Kelowna, BC. Of all the magnetic features sampled, the exploration target showing the most interesting combination of metallic anomalies was Toro 7, located less than 5 kilometers from the Eastmain-01 road. Till samples were collected on a line 1086 m in length, down-ice from the 900m wide high-magnetic geophysical target. The highly anomalous Toro 7 values include two gold (“Au”) results (12,300 and 11,800 ppb), three copper (“Cu”) anomalies (110.5,62.2 and 54.1 ppm Cu) and five bismuth (“Bi”) anomalies (3.69, 3.97, 4.9, 6.52 and 8.97 ppm Bi). There were six additional anomalous gold results, all continuous with the highly anomalous Au results, providing a positive gold signal with a total length of greater than 800 m, and open to the north. Also anomalous were tin (4 anomalous values), antimony (2) and silver (2), each of which are good pathfinders for gold mineralization. Other anomalous element levels down-ice from Toro 7 were phosphorus (1), niobium (4), rare earth elements (“REE”) (4), tantalum (2), cobalt (1) and uranium (3). All metallic assays of till concentrate samples were interpreted using statistical population analysis. Values at or above the 90th percentile were deemed to be anomalous. Values at or above the 95th percentile were deemed to be highly anomalous. Gold values over 1,000 ppb (equivalent to 1 g/tonne Au in the till concentrate) were deemed anomalous while values over 10,000 ppb (equivalent to 10 g/tonne Au in the till concentrate) were deemed highly anomalous. These geochemical anomalies at Toro 7 are consistent with iron oxide copper gold (“IOCG”) mineralization. Other features of Target Toro 7 are also comparable with the characteristics of IOCG, as shown in Table 1. Gold and copper anomalies in till. Two highly anomalous and six anomalous Au values. Enriched in F, P, Cu, Au, REE, U, Ag, Co, Bi and W.
Lafrance, B. 2009. La filière plutonique comme outil d’exploration pour les IOCG : Applications en Abitibi. Projet 2009-05. Consorem. Online. https://consorem.uqac.ca/production_scientifique/2009_05/Rapport%202009-05%20IOCG%20Abitibi.pdf . 72 pages. Faure, S. 2012. Potentiel de minéralisations de type IOCG en contexte intracratonique ou d’arcs continentaux dans les terrains archéens et protérozoïque du Québec. Projet 2010-08. Consorem. Online. https://consorem.uqac.ca/production_scientifique/2010_08/2010-08%20IOCG%20Quebec%202010_FINAL_.pdf . 29 pages. The Toro 2, Toro 4 and Toro 24 geochemical anomalies may potentially be explained by an IOCG source. The Toro 1, Toro 16 and Toro 22 anomalies could correlate with a carbonatite source. Carbonatite intrusions share the same geological context as kimberlites, as well as similar magnetic responses in the aerial geophysical surveys available to the Company. Toro 18 had three anomalous gold values (up to 22,000 ppb) and one anomaly in copper, molybdenum, lithium and tantalum. Toro 19 and Toro 21 had two anomalous gold values. Toro 23 had anomalous gold, copper and tungsten. Toro 24 till concentrates yielded three anomalous gold (up to 14,500 ppb) and copper values. These anomalies may be associated with intrusion-related gold mineralization near IOCG or carbonatite intrusions. Toro 9, Toro 14, Toro 15 and Toro 20 anomalies have geochemical patterns associated with lithium-bearing pegmatites. Toro 14 is highly prospective, yielding anomalous values in lithium (4), gold (2), zinc (2) and copper (2), as well as niobium, tantalum, tin and silver (1 each). Toro 14 also provided six till concentrate samples anomalous in total REE, with 3 such results well in excess of 1% by weight. Based on these results, the Company has staked 70 additional claims in the areas where strong geochemical anomalies were defined by the Company’s technical team, increasing the Toro Project’s footprint to a total of 130.32 square km. The till anomalies correlate well with 14 priority magnetic targets that could correspond to gold/copper mineralization in iron oxide copper gold deposits (“IOCG”), rare earth elements (“REE”) in carbonatites, intrusion-related gold deposits, or lithium mineralization in pegmatite. The pending claims on Toro 7 can be seen at https://evolvinggold.com/images/Figure-B-2.jpg . 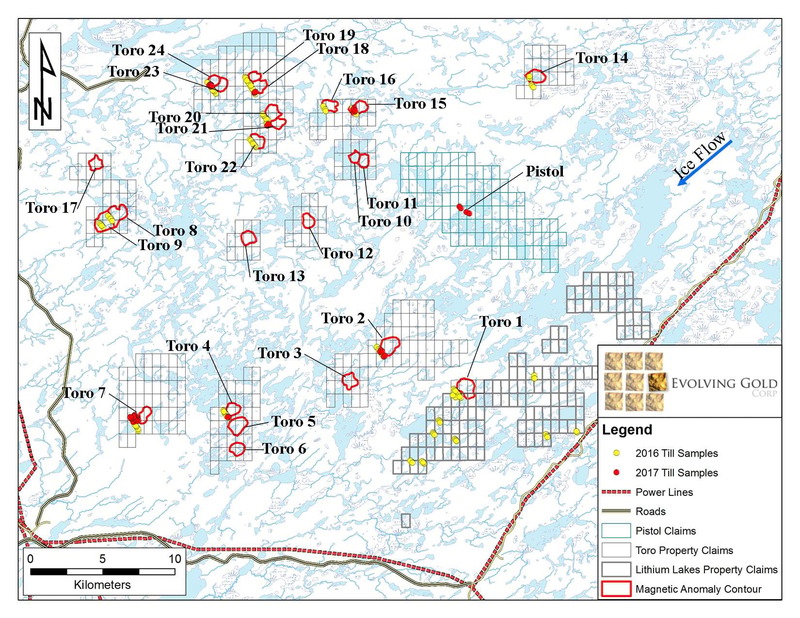 The pending claims on the entire Toro Project can be seen at https://evolvinggold.com/images/toro-quebec_lg.jpg. Toro 7 and other readily accessible exploration targets will be the subject of further field assessment by an all terrain vehicle based team to be dispatched in the first week of July 2017. A helicopter-based field program of the less accessible exploration targets is in the planning stages, and is expected to begin later this summer. 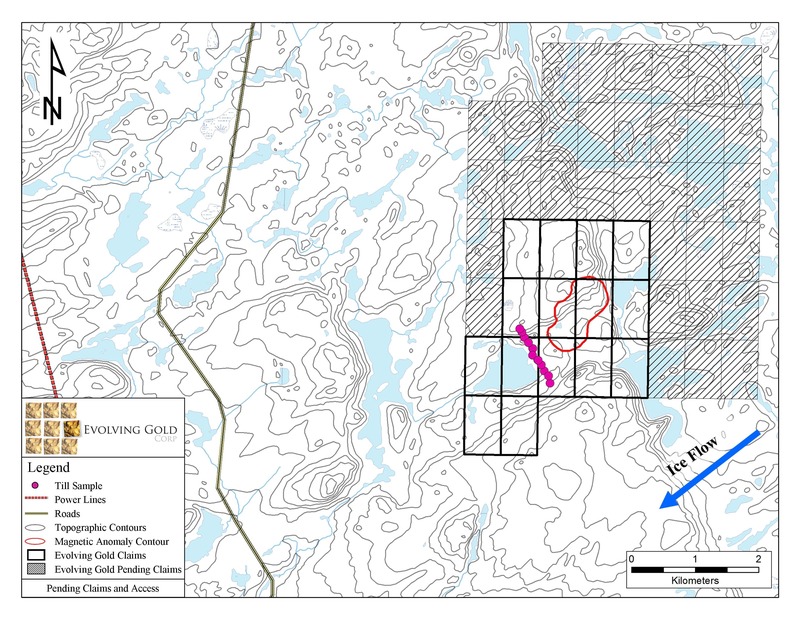 Another goal of the till sampling program was to assess kimberlite indicator mineral (“KIM”) content down-ice from selected circular magnetic targets on its Toro Property which were first described in a press release dated September 15th, 2016. A total of 16 possible kimberlite targets were investigated for KIM out of 24 such targets, selected on the basis of their geophysical characteristics. In the field, a sampling line was oriented perpendicular to the historic glacial flow and down-ice from the target, with a sample spacing of approximately 100 m. Each till sample was screened in the field to collect approximately 5 kilograms of fine material. For each field sample, a heavy mineral concentrate was isolated in the laboratory by C.F. Minerals using dense media separation followed by magnetic separation. These concentrates were then assessed for KIM using optical picking and microscopy, and later assayed for metal content. The KIM results for the potential kimberlite targets assessed in the Phase 1 field program were all negative or inconclusive. However, the numerous anomalous and highly anomalous metal results in the till concentrate samples are strongly suggestive of other types of intrusive features with similar magnetic signatures. 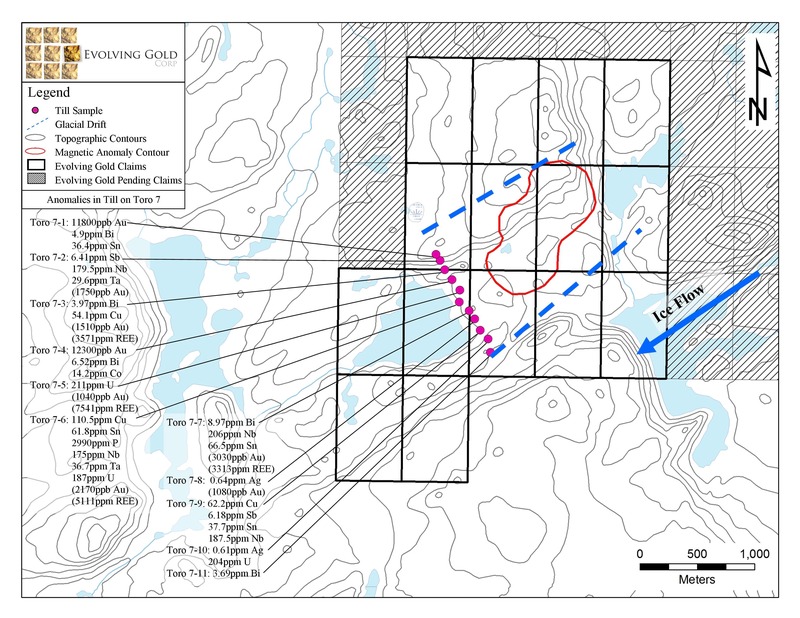 Evolving Gold is also exploring the 130.32 square kilometre (total area) Toro Project, in the vicinity of the Lithium Lakes property. The Company's immediate exploration goal is to assess numerous geochemical anomalies in till samples collected down-ice from large magnetic anomalies.